FIRST - Do they really work? An Oral Irrigator is basically a tiny tooth-cleaning gadget that produces a fine water jet in rapid pulses. It is designed for home use, rather than in the dental office. The fine jet of water is great for cleaning debris from small spaces around dental implants, under dental bridges and also between your own natural teeth. THEY DO WORK. There's a LOT of research that shows that oral irrigators such as the WaterPik can get rid of more plaque from in between your teeth than just using a brush and some floss. Actually, the WaterPik also has the approval of the American Dental Association. I recommend the WaterPik Aquarius as MY TOP irrigator. Should I get an irrigator? If you have some little gaps between your teeth (maybe due to gum disease), or spaces under a bridge, or if you have dental implants, then a water-jet irrigator will be a VERY EFFECTIVE ADDITION to your toothbrush and floss. There are many makes of oral irrigator on the market; some are better than others. And some are, frankly, disappointing. One of the disappointing ones is the Sonicare AirFloss from Phillips. It just doesn't seem to work very well, and there have been a lot of reliability issues. Here are the BEST 3 water-jet devices that I have found to be useful. I think that they are the BEST irrigators available on the market at the moment. Oral Irrigator - the dentist's opinion! The WaterPik available from Amazon is the only oral device in it's class with ADA approval. It's my FIRST CHOICE. The WaterPik Aquarius has an almost bewildering array of settings - BUT it's very easy to use! It has 10 pressure settings, so you can find a level that's comfortable for you. Also, it has 2 operating modes; the "floss" mode, and the "Hydro Massage" mode. The massage mode is gentler, with a lower water pressure and lower pulse rate. The standard number of pulses per minute is 1,400. That's a high pulse rate! The first is a simple water-jet irrigator on its own, with a base station. If you already have an electric toothbrush and just want to add an irrigator, this is one option for you. The second version is the OxyJet Oral Care Center; a combination base station for an electric toothbrush and an oral irrigator. The OxyJet irrigator is different in that it mixes air and water into "micro bubbles", and then pressurizes it. The pressure of the water jet is significantly more than the older design "Hydro Floss" device, but the minute air bubbles cushion the impact. So this design is a bit like a jacuzzi for your teeth! Oral B claims this is more effective for removing food debris and plaque. One thing to remember is that even the best irrigator is NOT a complete replacement for a good sonic tooth brush. I recommend brushing your teeth first, and then afterwards go around the teeth again with your WaterPik Aquarius oral irrigator or OxyJet irrigator. The OxyJet is not always easy to find, and unfortunately availability seems to be a bit limited. The WaterPik Aquarius is easier to find at Amazon, and the best prices are usually to be found on Amazon. The POSEIDON oral irrigator, with inductive charging. This is a recent entry to the market, and is MY THIRD CHOICE. I like it because it great for travelling! This is because it is quite compact, with a small water tank, AND it takes voltages from 110V to 240V - perfect!It has 3 operating modes; Normal, Soft and Pulse. I RECOMMEND THE PULSE MODE. The water tank is relatively small, and tends to run out if you spend more than 60 seconds using the device. BUT it's no problem to simply top up the tank again! I recommend using a special mouthwash in the water tank, such as TheraBreath Oral Rinse from TheraBreath. Here's a link to Amazon for the BEST price on the Poseidon; just click HERE. Once again, remember that an oral irrigator can only do so much. It's not an alternative for a good toothbrush, it's an additional tool! To get the best results, you must brush your teeth before using the irrigator. 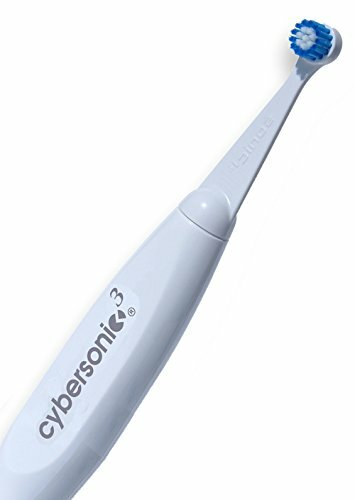 I recommend the Cybersonic 3 to all my patients. Click HERE to learn more about this toothbrush, AND get your special discount code.